WASHINGTON, DC, January 23, 2013 (ENS) – Pacific bluefin tuna numbers have dropped 96.4 percent from unfished levels due to decades of overfishing, finds a new stock assessment, prompting conservationists to call for a moratorium on the fishery. Like the closely related Atlantic bluefin and southern bluefin, the Pacific bluefin is a commercially valuable species and several thousand tonnes are caught each year. 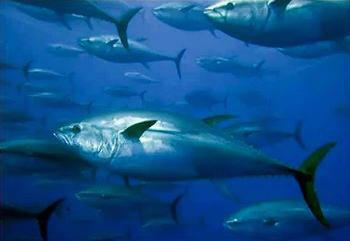 Fishermen from Japan, Mexico, South Korea, and the United States all fish Pacific bluefin, but about 80 percent of the Pacific bluefin caught are consumed in Japan. 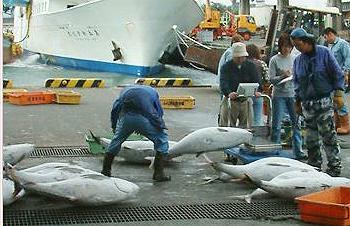 Tunas that are suited for sashimi and sushi can reach very high prices. 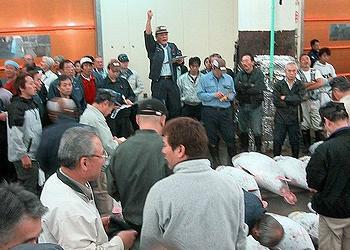 On December 30, 2012, a 489-pound (222 kg) Pacific bluefin tuna caught off northeastern Japan was sold at the Tsukiji fish market in Tokyo for a record US$1.76 million. The price works out to $3,603 per pound. It was bought by Kiyoshi Kimura, president of Kiyomura Co., which operates the Sushi-Zanmai restaurant chain. The nonprofit Pew Environment Group was shocked by its findings. “Just three days after a single Pacific bluefin tuna fetched a jaw-dropping $1.76 million at a fish auction in Tokyo, Japan, scientists released a new stock assessment for this species – and the findings are shocking,” the environmental group said in a statement..
“These new data show that the population of Pacific bluefin is a small fraction of what it used to be, and is in danger of all but disappearing,” said Amanda Nickson, who directs global tuna conservation at the Pew Environment Group. Despite these findings, countries are still fishing for Pacific bluefin tuna in its only known spawning and nursery areas in the western Pacific Ocean. Pacific bluefin tuna, Thunnus orientalis, is a single Pacific-wide stock that is managed by both the Western and Central Pacific Fisheries Commission and the Inter-American Tropical Tuna Commission. Although found throughout the north Pacific Ocean, spawning grounds are recognized only in the western North Pacific Ocean. A portion of each cohort makes trans-Pacific migrations from the western to the eastern North Pacific Ocean, spending up to several years of their juvenile stage in the eastern area before returning to the west. The current management measures in the western Pacific do not limit overall catches and fail to ensure the long-term sustainability of this fishery. “The Pew Environment Group believes the most responsible course of action is to immediately suspend the fishery until significant steps are taken to reverse this decline,” said Nickson. “We call on the major countries fishing this species – Japan, Mexico, South Korea, and the United States – to immediately take necessary conservation and management actions for Pacific bluefin,” said Nickson. Measures needed include science-based catch limits, and major reductions in the catches of juvenile bluefin by implementing size limits across the Pacific and preventing fishing on bluefin spawning grounds. Conservationists say robust monitoring and enforcement measures must also be implemented to ensure that the rules are followed.